I had no idea that I’d made a mistake. I’d simply followed instructions from our band director: fill in the back of the airplane so the basketball team has plenty of space at the front. I plopped down into the aisle seat in Row 21, eager to see how the UCF Golden Knights were faring against Carolina’s mortal rivals down in Columbia, South Carolina. I was sitting in head coach Roy Williams’ seat. How was I supposed to know Coach Roy has a tradition and superstition of sitting in the twenty-first row of the team planes? We had no clue that he sits on the right with his wife (if she’s traveling) and long-time assistant coach Steve Robinson sits across the aisle on the left. As soon as we learned this, of course, those of us in the row were happy to accommodate him. When your team has just finished a dominant performance in the second round of the NCAA tournament, we fully believe you deserve to sit wherever you’d like. Not to mention when you’ve just reached your 19th career Sweet 16 appearance after improving your Round of 64 record to 29-0. Roy’s superstitions are well-documented. From getting rid of suits worn during losses to exclusively using blue markers on locker room whiteboards to even spitting in the Mississippi River during tournament runs. Learning about this airplane row superstition is just another little detail to add to the extensive catalogue of his quirks. Similarly, this interaction with Coach Roy got added to the other many great moments during the pep band’s trip to Columbus with the basketball team. The city itself was a great host, handling six tournament games in three days. Our hotel staff was always lovely despite the crowds of fans wanting photos with players, the constant requests for basketball games to be turned on, and the band playing at full volume in the lobby at 7:30 P.M. as the team loaded up for its first game. We toured Ohio State’s campus, explored the downtown and arena districts, and traveled to check out the Columbus Zoo. Last season, the band seniors weren’t quite as lucky. The team was surprisingly bounced in the Round of 32, with the first weekend of the tournament being the only weekend we’d be attending. Now, with the Tar Heels rolling through Washington Sunday afternoon, they’ll head to Kansas City this week for a matchup with Auburn on Friday. While Coach Roy, the team, and many band members are already thinking about the details this next trip, I’ll be staying behind for this weekend. If we’re lucky enough to advance further, then I’m slated to go. 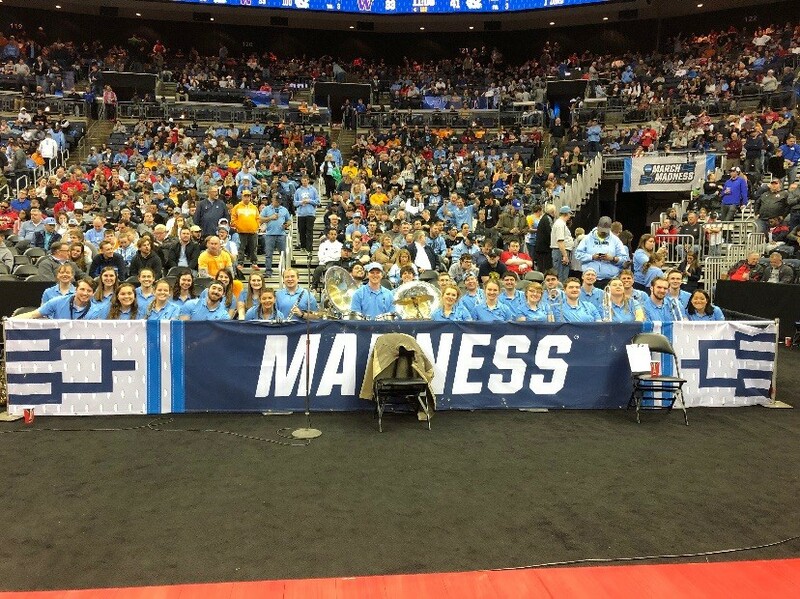 But even if we don’t, I now understand why traveling with the basketball team is such a coveted activity and reward for UNC band members. It provides great memories and unbelievable privileges that most Tar Heel fans would melt over the opportunity to experience, like learning a new superstition of your Hall of Fame head coach. Or like accidentally taking his seat on the plane.